(1) It is a productive landscape that by a design intervention will resolve an existent malfunction in the physical environment. This malfunction may already be explicitly present by negatively affected ecological, societal and economic development. The malfunction may also be artificially introduced in a landscape, because the environmental interactions are expected to be resilient against an introduced stress, i.e. respond with a beneficial processing. The design effort lies in the determination of the components, scale, position, time and set of human/animal interactions, by which a landscape could adapt to a desired functional situation. The malfunction (or induced stress) needs to be quantified to predict the material interactions and it also needs to be qualified to understand the type of interactions to facilitate new routines of human/animal involvement. (2) The machine-aspect consists of ecologically described processes that are either enlarged or stimulated to perform. These will continuously interact with each other, affecting the shape, scale and position of components within the landscape. There is a dynamic exchange, a continuous shift of ecological interactions, because there is a continuous disturbance of the system by large scale harvesting of crops, fresh water, cleaned soil or animal stock. There is need for a book keeping model of all the input and output that runs through the system. (3) The design and evaluation of the functionality is made explicit by an input-output ratio, i.e. metabolism of the system. This can both be monitored quantitatively (e.g. amounts of water retention and waste decomposition) and qualitatively (e.g. human and animal responses and well being). The overall development can be simplified by four stages: an initial stage, a growth stage, a yield stage and a steady state stage. During the initial stage an intervention is made in the landscape and the related societal/(a)biotic types of engagement. The growth stage is transitional due to various parallel successions that interact. During the yield stage the Landscape Machine entirely regulates itself, is powered by renewable resources and will provide a maximum amount of ecosystem services and goods. 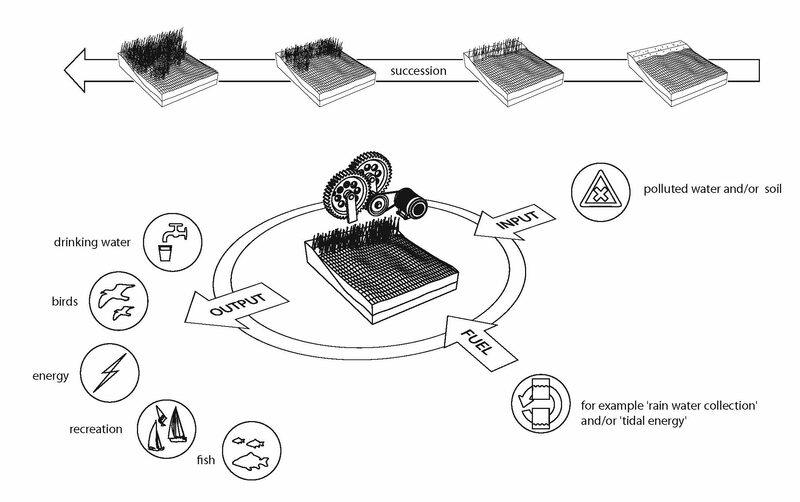 The steady state stage would be the ideal state of the landscape machine because it indicates that the continuous harvesting of products can coincide with continuous shifts within the landscape, maintaining an abundance of biodiversity (ad. 2). Preferably developing into the dynamic and dissipative ecosystem such as mangrove forests, wetland systems or highland peats. Yet it could also evolve into a steady state that is no longer productive. This would mean a failure according to the intended design, but a success to a newly introduced ecological state.